The Big Idea: Three 2:00 AM friends can make up for a multitude of disappointments. Sooner or later we all realize that friendships are a beautiful thing. We realize that we need some other men who walk in our same shoes–who share similar problems and life experiences. But adult male friendships are difficult to start and hard to keep. As a result, most men have a friendship deficit. Yet without friends, we’re highly vulnerable. In this lesson we’ll explore what a true friend looks like (that will help us manage our expectations), and then we’ll talk about how you can make true friends. Good morning, men! My wife and I were out in the car the other day and we pull up to a traffic light next to a Lamborghini. It’s just sitting there rumbling, making our windows reverberate, and then the light turned green and he hit it! Zoom! I said, “Wow! Can you believe that?” My wife turns to me and she says, “I can’t believe that guy would do that!” I’m thinking we will never see eye to eye on certain things! That’s why we need to have some male friends! We’re going to talk about friendship today. We talked about wives last week and we’re going to talk about male friendships today, all kinds of friendships really, but especially male friendships this morning. For those of you who are not married, this of course will be of more particular interest. Before we do that, let’s do a couple of shout outs. The first shout out today goes to a group called Himprove of The New You Church in Orlando, FL. I love that! 10 men who have been meeting for 3 months at the Pastor’s home on Sundays at 7:00 PM using the Video Bible Study. Led by Dario Brito. Pat Leupold is the Area Director for the Orlando, FL region. The second group is the Men’s Group of Potomac Baptist Church in Potomac Falls, VA. 8 men who have been meeting for 12 years. They currently meet at members’ homes on Wednesdays at 7:00 PM using the Video Bible Study. Led by Grady Wortman. We are looking for Field Staff for this region in Virginia. So I wonder if you would join me in welcoming these two groups to The Man in the Mirror? One, two, three, hoorah! Welcome guys, we’re really glad that you’re here! 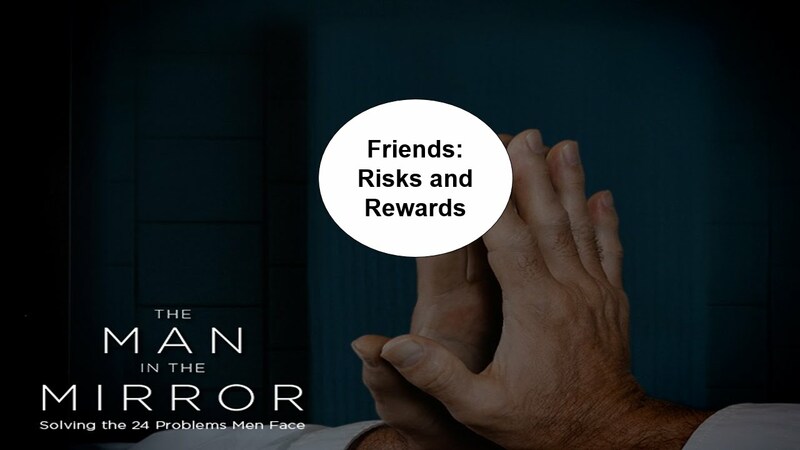 So today’s message is Friends: Risks and Rewards. I have had the honor and the calling to meet with men in one-on-one conversations. I’ve been doing that for forty years! Wow! Probably doesn’t come as a surprise when you look at me. So when I say I have literally met with thousands of men in one-on-one conversations, whether that’s breakfast, coffee, lunch, whatever, when you take the forty years and add it up, you can see that doesn’t have to be an exaggeration to get to thousands of men literally. I love doing it! When men do want to meet with me, often there is some sort of an issue. Over the years I’ve catalogued what these issues are, these inner aches and pains that men have. There are seven things that when a man tries to describe what’s going on in his life that inevitably are the reason. Number one, I just feel like I’m in this alone. Number two, I don’t feel like God cares about me personally, not really. Number three, I don’t feel like my life has a purpose. It feels random. Number four, I have these destructive behaviors that keep dragging me down. Number five, my soul feels dry. Number six, my most important relationships are not healthy. Number seven, I don’t feel like I’m doing anything that will make a difference and leave the world a better place. It’s so interesting to me, and the first one is I feel like I’m in this all alone, it’s so interesting to me how many of these issues resolve when we have friends. When we have a group of brothers we’re living life with, when we’re not living in isolation. Isolation is the number one strategy of the enemy. He knows that if he can get you culled out from the group, you’re vulnerable. You’re vulnerable to loneliness, and really all those seven things. 11 Also if two lie together they will keep warm. But how can one keep warm alone (just think about that culture where this was written in, and it becomes so cold at night)? So we met together once a week for thirty-two years. Literally, everything I’ve ever done, whether in business or in ministry, I ran it by Ken first. He was my friend, my confidant. He would give me counsel. He would tell me when my idea was really stupid. I’ve never met an idea I didn’t like. Basically, God has created me to be un-encumbered by seeing why an idea wouldn’t work, so I just think every idea is great! So I need friends to keep me on track. Perhaps you do, too. Isn’t that amazing? Listen, most of you can get together six men to be your pallbearers, but how many of us have a friend that we can call at 2:00 AM? So here’s the Big Idea for today: Three 2:00 AM friends can make up for a multitude of disappointments. There’s a huge difference between a friend and an acquaintance, and I think everybody knows what that is. There’s also a difference between a close friend, and those people who are in your circle of friends, and probably, there are many of us here who we consider ourselves to be each other’s friends. I know I consider many of you to be friends, but I’ve never been in your home. I don’t know the names of your children, you see? So we’re in a circle of friends together, we love each other and we care about each other, and I would rush into a burning building to save you. Yeah, I would, but we’re finite. There’s just not enough time to have intimate, close relationships with fifty people, it’s just not going to happen. So, the idea of having a few people that you can really invest your lives in deeply, that’s the kind of idea that we’re talking about today. but faithful are the wounds of a friend. springs from his earnest counsel. but there is a friend who sticks closer to a brother. 43 Jesus called out in a loud voice, “Lazarus, come forth!” 44 The dead man came out, his hands and feet wrapped with strips of linen, and a cloth around his face. God has designed us for relationships. God could do everything in your life that needed to be done if he wanted to, but he has chosen instead to put us in communities, to put us in relationships, to have a few brothers who will help us unbind each other, unloose each other, take off those grave clothes. He’ll raise your friend from the dead, but then he wants us to be involved in each other’s lives to help us become free in Christ, to experience our freedom in Jesus. It’s a beautiful picture! This is what friends do! When things go sour and you really feel lousy, do you have a friend you can tell about that? Do you have a friend you can express any honest thought without fear of appearing foolish? Do you have a friend you can talk through a problem without giving you advice? Someone who will just be a sounding board? Will your friend risk your disapproval to suggest you may be getting off track in your priorities? Do you have a friend who will take the risk to tell you that you are sinning or using poor judgment? If you have had a morale failure, do you have a friend who would stand with you? Is there a friend with whom you feel you are facing life together? A friend to talk over the struggles of life that are unique to men? Do you have a friend you believe you can trust, with whom confidential thoughts will stay confidential? When you are vulnerable and transparent with your friend, are you convinced he will not think less of you? Do you meet with a friend weekly or biweekly for fellowship, prayer, and possibly accountability? That’s what true friends do, that’s what authentic friends do with each other. The Big Idea: three of these 2:00 AM friends can make up for a multitude of disappointments. Life is hard! Life is a struggle! We have to do our work while feeling the prick of thorns. We have to manage against the fall, and we can’t do that alone. We’re not designed to do that alone, we’re designed to do that in relationships with 2:00 AM friends. Is there anybody that you could call, right now, at 2:00 AM? I’m guessing that for most of the men in this room, the answer is yes, but you also should know that for most of the men in the world today, the answer is no, they really don’t. There’s quite a bit of statistics out there. I’m not quoting them this morning because I couldn’t find one that I felt confident in the scholarship of, but there are a lot of statistics out there that say the vast majority of men do not have a friend, especially if they’re over thirty. She said no, and that’s a story for another day, but the point is I persisted, and the point is the task, whatever you want to do together as friends… Here’s the formula, I’m just going to give it to you, it’s A R T T. Appointment, Relationship, Trust, Task. So if you want to have a friendship, marry a woman, have a buddy that you can go to the NASCAR races with, whatever it is! Whatever that task is, that will not happen unless there is trust. Trust will not happen if there’s not a relationship, and a relationship cannot happen unless there’s an appointment, unless you get together. So the first step in this process of relationships is not saying hey Eric, I am looking for a true friend, a close friend, a faithful friend, somebody that I can be authentic with and we can have personal vulnerability and transparency and really build a life together and be lifelong friends, and rush into burning buildings for each other and die for each other. So I was wondering if you would be that friend for me? I think that might violate the process of relationships! No! So if you want to initiate, the first step is just to ask somebody for a cup of coffee and just see if the chemistry is there, and it might be there for one person and not the other. This is part of the fall, okay? So it might not be the first, second or third guy, but you have to start by taking that step of going for a coffee or breakfast. Second, when there is this chemistry, then a relationship begins to build. So you guys hit it off and then you decide you would like to get together again. So in a couple of weeks you get together for a second time. And that goes well, so you decide to get together again, and before you know it, you’re just sort of friends, because there’s a point in every relationship where trust begins to filter in. When I was dating Patsy and I would tell her things, I could tell she didn’t exactly trust me, because why? Because she had been lied to before. So it took time to develop that relationship into trust. Then, when trust came to full bloom, I popped the question and she said yes. So this is the process of relationships. Don’t violate the process of relationships. Finally, the other way you can make some true friends, in my opinion, is to be in a small group, and here you are! Be in a small group with some other guys where you have a… Let’s call it a structure, already prepared for you to become part of something that does the A R TT, that gives you a place where you can gather. It’s on your calendar for crying out loud! What’s better than that? Than having a place where you can build some friends over time on your calendar every week? An appointment, a weekly appointment to build these friendships. Another man in the same group is a prominent doctor, and he grew up in a home with a father who was a raging, angry alcoholic, and he had never told anybody about it. That day he told the other men what was going on and they helped him take off the grave clothes, and he too has had his life profoundly changed. You can have your three 2:00 AM friends right here in your small groups, all you have to do is open up. The Big Idea today: three 2:00 AM friends can make up for a multitude of disappointments. Let’s pray! Our Father in heaven, Lord, we come to you humbly. Lord, we don’t want to be alone and we don’t want to be lonely either. We know that you have created us for relationships. Lord, help us to take the initiative. Help us to find those 2:00 AM friends that can help us overcome this multitude of disappointments that we all go through in life. Lord, may the beauty of friendship look attractive this morning, and we’ve also helped explain what friends actually do. Help us to be that kind of friend, help us to find those kinds of friends. Lord, for those of us who already have friends like this, maybe today is the day that we just say to our friend thank you so much for being my friend. In Jesus’ name we pray, amen! Great study for men’s ministries.